HENRY LE JEUNE Sheet of Ink Drawings, Signed. Henry Le Jeune ( sometimes referred to as Henry Lejeune). English painter. 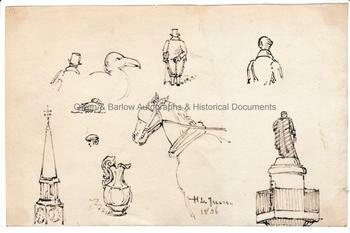 A sheet of pen and ink drawings of figures, birds, a church spire and a monument. Signed and dated "H. Le Jeune, 1836". On paper. 21 x 13.5 cms (8.25 x 5.5 inches). Mounting traces to corners of verso. Very good. Interesting early sketches by Le Jeune who, at the time of their execution was studying at the Royal Academy School and was aged about 16. He won the RA's Gold Medal in 1841 and went on to establish a reputation as a very successful genre painter.